Beautiful charming flat, very romantic, ancient residence of the owner's great-grandfather, Notary of Montepulciano. Recently wholly renovated, very quiet, in a very beautiful location: in the historic center of the town, but overlooking the city walls in a dominant position. Two delightful, romantic bedrooms tastefully decorated, smartly furnished, both with hardwood floors, beautiful frescoed '800 ceilings, and a magnificent view to 180° over the entire Valdichiana and Trasimeno Lake. Very bright living room with exposed wooden beams and tiled floors. Full kitchen with electric oven and microwave. Sleeps 4 (1 double + 2 single attachable) +2 (2 sofa-bed). Enjoyed all year round. Cozy and clean apartment, good location, beautiful view. A wonderful stay at this nice home in the heart of Montepulciano. The apartment was cool, quiet, and clean. Warm reception by the neighbor and people of the town. Excellent! This is a delightful apartment in a wonderful location. The hostess is helpful and considerate. Perfect choice! Thank you a lot, Celeste! I hope to host always guests like you: kind, respectful and friendly. See you soon!! We really enjoyed our stay in Montepulciano and Fernanda’s place is very cute, perfect location with a beautiful view out the bedroom window! The beds were very comfortable! Thank you, Lori! You and your family have been fantastic guests: I hope to meet you again! We stayed a week in Fernanda and Ferruccio’s wonderful apartment. It is very well-located and is easy-access from the bus station; they actually met us at the station and escorted us up to the apt! Well-equipped kitchen. Very comfortable bed. Awesome frescoes in bedrooms. Amazing views from bedroom windows. Prepare yourself for lots of walking up steep streets and lots of wine! Don’t miss having at least one meal at Osteria Acquacheta. Steve and Lara were the perfect guests! Very kind and respectful of the house rules. Really easy communicate with them. I hope to host them again! The apartment was typical Italian which we love and the location was excellent. The apartment was close to the main gates of the historic town which made it easy to come and go. Yet the actual street was quiet. Perfect lication. It waa well fitted out and well presented. 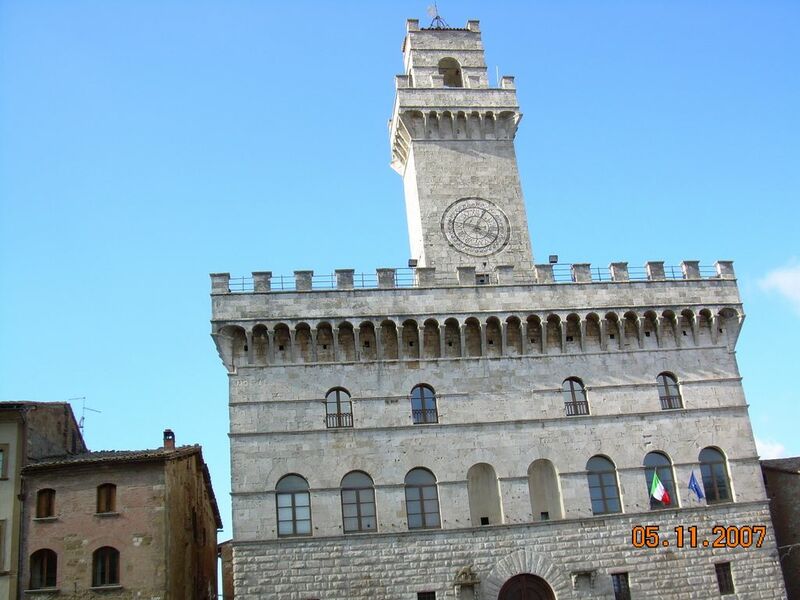 A wonderful experience in Montepulciano! Montepulciano, not surprisingly known as 'the pearl of the '500', offers many artistic treasures, and is visited each year by thousands of tourists from all over the world. Several local restaurants, with excellent Tuscan cuisine (do not miss the 'pici' and Chianina steak). A must visit the cellars where they produce the famous Vino Nobile, and especially the Contucci Cellars, and Redi's Cellars, the most ancients and evocative, with the possibility of tasting the famous wine. For a pleasant stop for a tea or a drink, we recommend the famous Caffè Poliziano, on the Corso, in exquisite style 'art nouveau', already favored by Federico Fellini and other artists. No shortage cultural and folklore events: the Fair of 1st May is famous throughout the province, and for the entire month of July will alternate performances (theater, music and dance) of the 'Cantiere Internazionale d'Arte', with artists from around the world. In the days around the middle of August, in the evening is held outdoors, in Piazza Grande, the 'Bruscello', popular representation in costume, the last heir to a tradition at one time living in the countryside of Siena. Throughout the month of August and until mid-September are held the dinners 'in Contrada', rendezvous for gourmets, where the city's Contradas challenge each other in delicacies... And finally, the last Sunday in August, takes place on 'Bravìo of Barrels', a kind of 'Palio' in which undertake the representatives of the Contradas, preceded by a magnificent parade in costume in which the highlights are fantastic flag bearers.